Malaysiakini clip via Unspinners' "Tun M ngaku bukti tak cukup untuk laporan polis, dakwa 1MDB"
"I don't have enough evidence." - Dr Mahathir Mohamad, when asked why he's not lodging a police report against PM Najib Razak "not even after what he's done". (in my days, reporters would insert the word "allegedly" somewhere in that sentence!). A kurang asam reporter would have asked: Not enough evidence or no evidence, Sir? But he/she would be without a job the very next day. But there's all the evidence that while we try to tear apart the 1MDB in the hope that it will help us bring Najib down, the interest in 1MDB's assets remain keen even if it's a bit cautious. It's two foreign investors vs a lone local hopeful. “As the sole off-taker of all power generated in Malaysia, TNB is the best and most logical buyer for these assets. The acquisition of these power facilities, which will add a significant contribution to our power generation capacity in Malaysia, will be an important addition to our business as it will further enhance TNB’s earnings and cash flows. Broadening our domestic and overseas power generation base gives us more opportunities for revenue growth and for adding significant shareholder value”. TNB added that if it decided to pursue this acquisition, it would have to have an opinion from an independent adviser stating that the transaction is fair and reasonable and secure the approval of shareholders at an EGM. 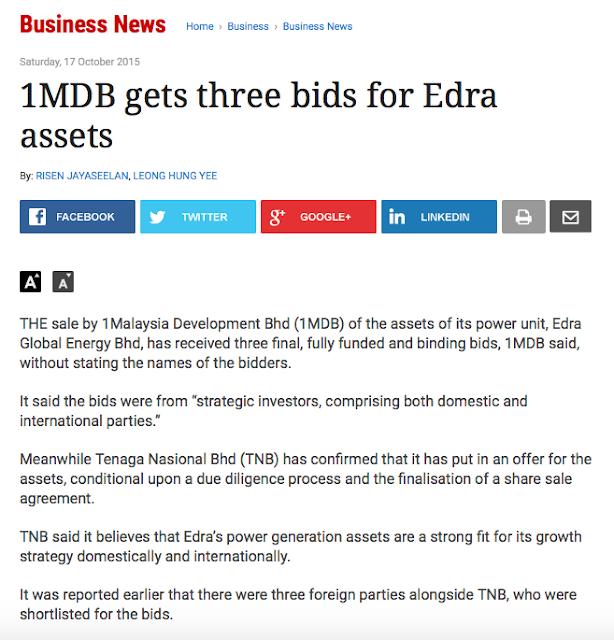 1MDB said that the three bids for its power assets marked a significant milestone in its rationalisation plan, first announced by the Finance Ministry on May 29, 2015. “Over the next few weeks, 1MDB will be conducting an evaluation of the offers received, including reviewing the terms and conditions of the definitive agreements that the parties have proposed, and seek clarification where required. “As previously highlighted, our board of directors will be guided by, among other things, value maximisation to 1MDB’s shareholder, deal certainty and terms that are fair and reasonable in assessing these offers. We expect to enter into a definitive agreement with the chosen party shortly after the evaluation and negotiation process has been completed, before the end of 2015,” 1MDB said. Rocky, never underestimate Tun. Following Tun all these years, he is one who will not do something unless he is sure of the facts and the circumstances as well as evidences. With "enough" evidence also Najib is still the PM of Malaysia and still not being charged and than what do you expect Tun to say - he have all the evidence ? All the evidence with Khairuddin Abu Hassan....that's why he doesn't need to do the police report. You see, Komedi, just because John Kerry and the FBI do not talk about 1MDB in a formal meeting that has nothing to do with 1MDB, does NOT mean that the US is not investigating 1MDB. Maybe the head of the FBI can be transferred to the PMO? The evidence is the fact that BNM is asking about the Petrosaudi scam money. The public has been cheated. Please note that the approvals given by Bank Negara between 2009 and 2011 for the movement of funds abroad totaling US$1.83 billion were conditional upon 1MDB utilising the funds for specific purposes. When it became abundantly clear that 1MDB did not adhere to the terms of the approvals given, the central bank conducted its own investigations on the money flow. Thereafter, the issues of embezzlement and money laundering would have surfaced and Bank Negara then referred the matter to the AG expecting prosecution of the guilty parties. Bank Negara's approval is very specific. What 1MDB does with the money after obtaining approval is not within Bank Negara's control. But if they have breached the approval conditions, then the management of 1MDB must be held responsible. Bank Negara is now being questioned by the AG as to why they gave the approvals in the first place when there was incomplete or inaccurate information. Have they all forgotten that this is a sovereign fund backed by the government? It is solely 1MDB's management responsibility to ensure compliance with Bank Negara's conditions and there has been a blatant breach of the terms of approval. The action of the AG to kill the matter gives the impression that certain privileged people are being protected. No prizes for guessing who. 1MDB has "explained" the issue a dozen times. Like they claim. The Good Star deal was a theft of $700 million of public funds. What's so hard to get? 1MDB is now sticking its head in the sand and hoping the noise will go away. Oct 15 2015 Reuters - "Former Moldovan prime minister Vlad Filat was detained in parliament on Thursday over the theft of $1 billion from the banking system, a crime that has led thousands to camp out in the capital in protest. Television footage showed Filat being handcuffed by masked officials from Moldova's anti-corruption bureau. Anti-government protesters had blocked the exits to the building for most of the day to prevent him leaving. A spokesman for the anti-corruption office said Filat had been formally taken in for questioning. Under Moldovan law he can be held for 72 hours after which the court must make a decision on his status. Filat denies any connection to the large fraud, which has weakened the former Soviet republic's currency and damaged living standards in what was already Europe's poorest country. Thousands of protesters have camped out in central Chisinau since early September demanding resignations of senior government officials and early elections. Earlier on Thursday, Chief Prosecutor Corneliu Gurin asked parliament to strip Filat of his immunity from prosecution as a lawmaker. "We have irrefutable evidence that Filat, while prime minister, was directly involved in the withdrawal of money from the banking system," Gurin said in his written appeal to parliament. Of the 99 lawmakers registered to vote, 79 voted in favor of the decision, comfortably over the 51-vote minimum." You do realise that bodies like the FBI, DOJ, FINMA (Swiss), the SFO (UK) and the MAS (Singapore) do not waste time on frivolous matters, right? The freezing of bank accounts (in two countries) ties up those assets and places serious disadvantages on the account holders. This cannot be done unless there is very strong preliminary evidence of a crime. Kak Rosie's various appliances and tools (including the prepaid blog squad) keep screaming "fabrication!!!!!!!" but the fact is that the documents held by Khairuddin must have disclosed prima facie evidence of a crime, else they would have thrown the documents (and the cases) into the bin. As it is, most international investigations into 1MDB have reached phase 2, and are very much alive. Shame they can't be sabotaged, like the local ones were. "A kurang asam reporter would have asked: Not enough evidence or no evidence, Sir? But he/she would be without a job the very next day." No free press huh, people getting fired for rasing questions. Hahaha, what a spin, Latuk Locky ! 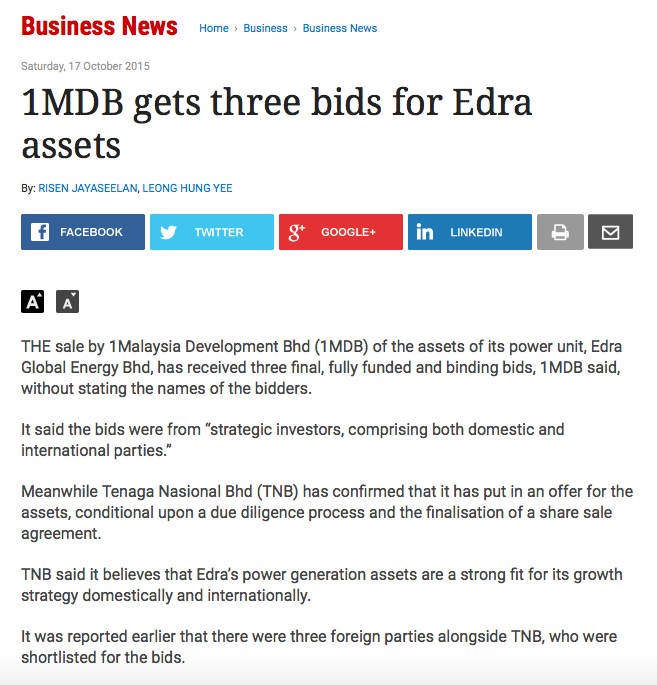 No other bidders other than TNB, and 1MDB still want to bluff the public. There will be lots of injunctions against TNB if it persists in bailing out 1MDB.